Armonia Celeste appears in Cumberland, Maryland, next week, as Mountainside Baroque presents “Benedicite Dominus” (Bless the Lord), the next concert in its “Before Bach” series. Carissimi’s famous oratorio “Jepthe” will be the concert centerpiece, with tenor Stephen Caldwell, baritone Ryan Mullaney, and bass Les Anders joining the three women’s voices of Armonia Celeste. Additional sacred music from Carissimi and other composers from the 17th-century Roman German College, the most famous musical establishment in Rome at that time, will comprise the rest of the concert. Viola da gamba, harpsichord, and the instruments of Armonia Celeste (lute, theorbo, and Baroque triple harp) will support the voices in historically informed accompaniment. 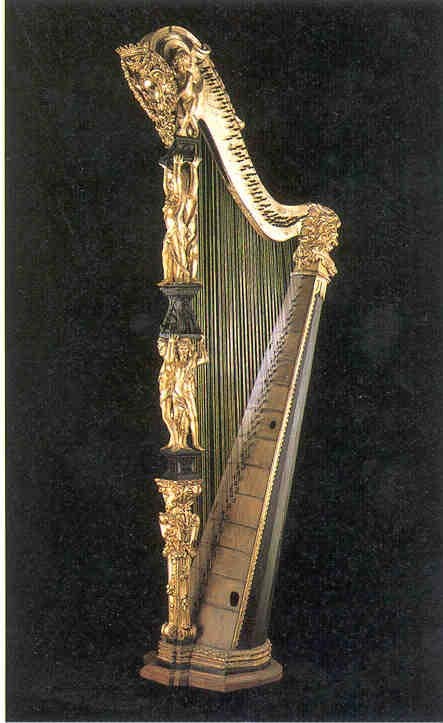 The harp featured in the concert, with its three sets of parallel strings, is an Italian copy of the famous Roman Barberini harp dating from ca. 1630. 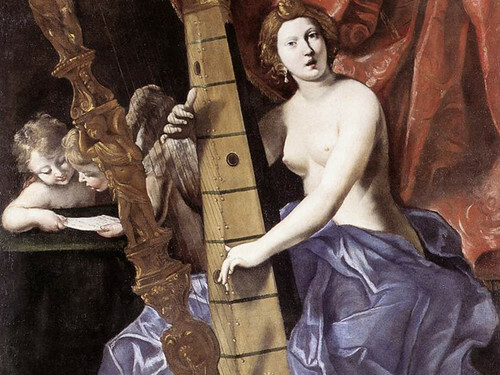 One of the largest and most elaborately decorated harps of the 17th century, it was depicted in paintings of the time. The concert will take place at 4:00 PM on Sunday, January 15, 2012, at the Shrine of SS. Peter and Paul (125 Fayette St.). (Overflow parking in the St. Paul’s Lutheran Church parking lot across the street will be allowed for this performance.) Tickets ($10 general/$7 students) will be available at the door. For further information, call 301-338-2940 or e-mail umbrella@mindspring.com. For more information about Armonia Celeste, please visit http://www.armoniaceleste.com. We kicked off our Texas tour with an exciting performance in Dallas that had audience members raving enthusiastically! It was very gratifying for us to meet so many wonderful, intelligent people after the show and hear how the performance moved them. One man–a musician himself–said it was the finest musical evening he had ever been to! That is a compliment we will treasure. 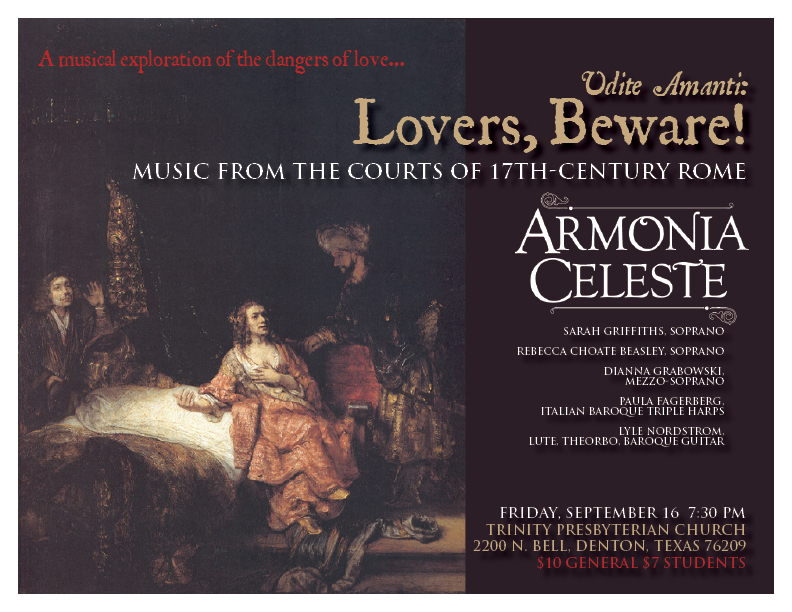 We repeat “Udite Amanti: Lovers, Beware” tomorrow night in Denton and Sunday afternoon in Tyler. The Denton newspaper published a feature article about us today that we will post on the website. Hopefully it helps bring in an audience as warm and wonderful as the one we had in Dallas!